A Theosophic Journal for Children and Young People / Devoted to the Study of Theosophy, Oriental Philosophy, the Occult Sciences and the Brotherhood of Man / A Theosophical Magazine / Official Organ of the American Section T. S.
Corporate author: Official Organ of the American Section T.S.1/1, July 1894-August 1899. $1.00 a year, 12-42 pp. 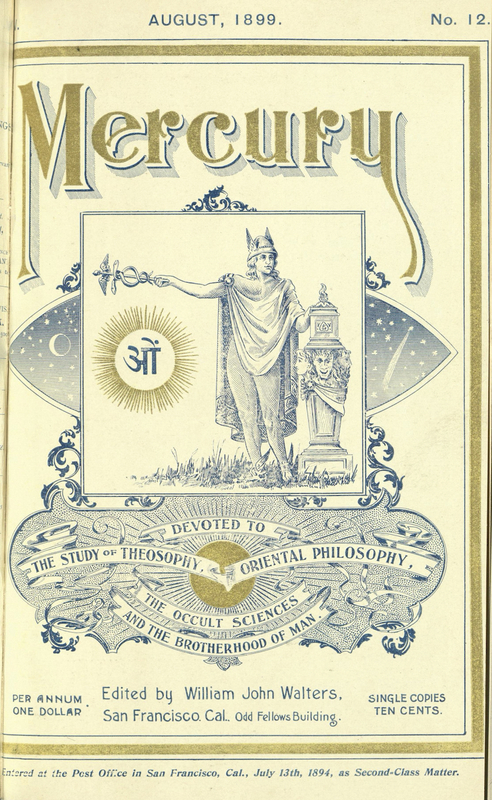 This was originally a magazine for children of Theosophists put out by Walters, who was the leader of the Lotus Circle in San Francisco, but after the sundering of the Theosophical Society it was transformed into the journal of the new American Section of the (Adyar) T.S., of which Walters was the first chairman. Noted in Miscellaneous Notes and Queries, 1896, in "List of Advance Thought Publications" in the Metaphysical Magazine, December 1899, 384. The journal is also noted in The Life, 1907, although it had long ceased to appear by that date. Walters went on to edit The Theosophic Messenger, which succeeded this journal, and another children’s journal, The Golden Chain, which was mentioned in Notes and Queries, 1900. Walsh was a Theosophist, novelist and reformer who also wrote for The World’s Advance Thought and for The Path. Paul Tyner, Alexander Fullerton, and, of course, Ella Wheeler Wilcox, contributed to the journal. In its later issues the journal carried a directory of branches adhering to the American Section, and also extensive book reviews and "Friends of Our Movement" (biographies, with photographs, of notable American Theosophists). Table of contents in austheos.org.au. Rutgers University; ZDB: Gottingen SuUB.